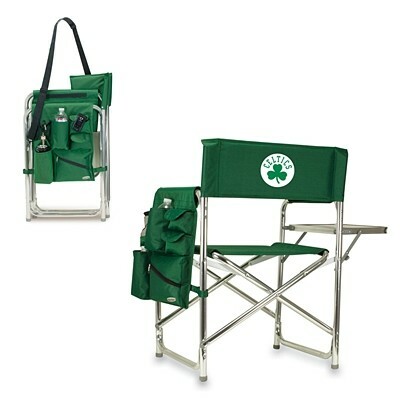 Customized with your choice of NBA team logo, this portable folding sports chair by Picnic Time features a lightweight-yet-sturdy aluminum frame, an adjustable shoulder strap, and two sturdy webbing handles. The director's chair has an extra-wide seat (19 1/2") is made of sturdy 600Denier polyester with padding for extra comfort. The armrests are also padded for optimal comfort. On the side of the chair is a 600Denier polyester accessories caddy that includes a variety of pockets to hold such items as your smart phone and sunglasses, an insulated bottled beverage pouch, and a zippered security pocket to secure valuables. A handy side table folds out to hold food or beverages (up to 10 pounds). Maximum weight capacity for the chair is 300 pounds.